Bring out your tribal best with this affordable didgeridoo from Angel. It has a hand-crafted, hand- painted design, and it has a wax mouthpiece. 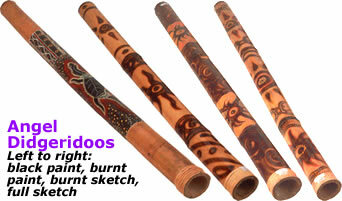 The didgeridoo comes with a free carrying bag. Length: 47 inches. Choose between 4 different finishes: black paint, burnt paint, burnt sketch, or full burnt sketch.